With six gas burners making up the hob, you'll find that boiling, frying or sautéing your food is simple. In addition, one of the burners is a 5kW dual wok burner, opening up a range of further cooking possibilities. Great for preparing a range of cuisines, you can use the central 0.48 kW burner for when you need a more delicate heat for your food, or use the full burner when you require quick and responsive high levels of heat. The oven offers up a huge 80 litres of cooking space, so you'll be able to fit in even the largest of Christmas turkeys or Sunday roasts without issue. With a multifunction cooking system, this cooker offers nine versatile and flexible cooking options and includes functions such as fan cooking, an oven quick-start, use of the top or bottom elements only, a pizza function, defrosting and various other convenient choices. A triple glazed viewing window and interior light allows you to keep an eye on your meal at all times and lets you ensure your food is cooked to perfection. 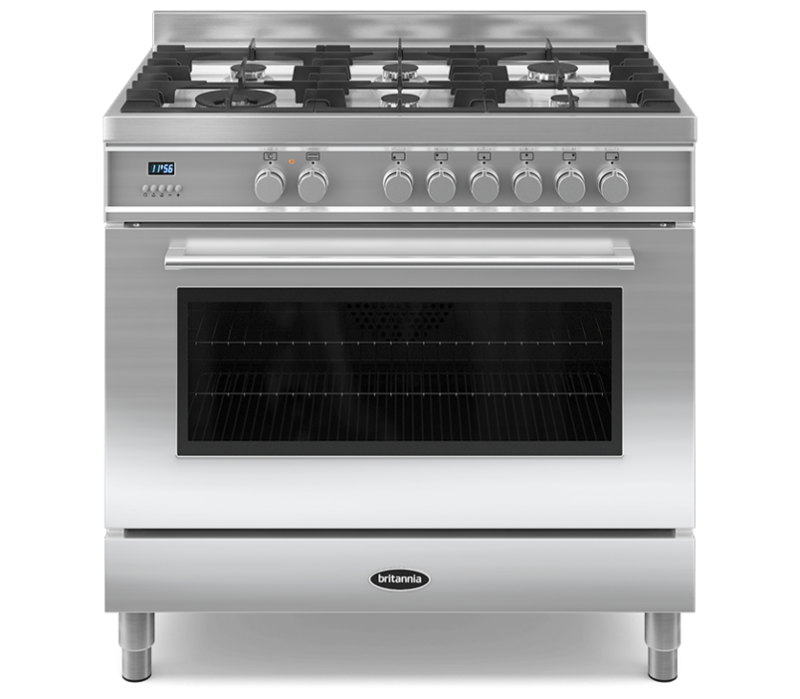 In addition, this Britannia RC9SGQLS Dual Fuel Range Cooker also hosts an integrated full-width electric grill and allows you to prepare healthy and tasty grilled meals, as well as allowing you to make tasty snacks. When it comes to cleaning, easy-clean enamel liners are fitted to the interior of the cooking cavity and make it simple to keep your oven spotless and splash free.